To the Editor: Humanity's present global course guarantees its extinction.1 Overpopulation leads to poverty, overcrowding, pollution of air and water, etc.2 Together with increasing unemployment and food shortages, these factors will greatly decrease the quality of life for millions of people.3 Countries exhibiting population growth are not likely to foreseeably spontaneously fall below replacement fertility.4 Ecological damage and depletion of non-renewable resources are proportional to population size.1,5 Food production cannot increase indefinitely without soil depletion, desertification, deforestation and other environmental degradation.6 Humankind can choose to check population growth by reducing the birth rate  instead of raising the death rate7 by means of famine, epidemics or genocide, as has been common throughout history. Humanity is in a demographic cul de sac,8 but no feasible and efficient overpopulation solution has been proposed. Potential solutions require a revision of some ethical clichés and the propagation of new ethical principles, e.g. no population group, whether national or international, should obtain political or other advantages merely because of its numerical size. Without procreative competition, different peoples will be more likely to live in peace as good neighbours. Since there would be no need for discrimination, the equality approach will influence the individuals or ethnicities with higher birth rates. The most reliable method of birth control is sterilisation9 that does not include gonadal removal.10 The last (or single) birth should be carried out as far as possible by caesarean section; although more costly, it poses less risk to the newborn and expedites sterilisation by fallopian tube resection. Vasectomy would also be particularly efficient. Sterilisation can provide a solution to the controversies around economic migration, to which opposition is growing in developed countries. Where an economy needs overseas labour, sterilisation would be desirable for a work and residence permit. A high-quality sterilisation service could be provided by the receiving country. To be efficient, such measures must include sanctions against families with many children, e.g. denial of free education and medical care to the second or third child. Unfortunately, the victims of such measures would be children who are not responsible for their parents' unwillingness to use contraception. Adversaries of sterilisation argue that it does not prevent venereal diseases and AIDS, but these conditions can be regarded as self-inflicted as a result of negligent or immoral behaviour, and can be considered as a private matter. But when children ensue, it ceases to be a private matter or an inherent human right as the number of children in a family is of public concern. Some people maintain that birth control and sterilisation are 'unnatural'. But death from infectious and parasitic diseases and many forms of homicide are natural, while survival in the case of a perforated appendicitis is quite unnatural. Religious objections against contraception and sterilisation are unfounded because there is no canonical mention of them, so implying neither disapproval nor prohibition. High fertility was propagandised in the age of global conflicts and the Cold War to replenish military and manpower resources. Population control has been obfuscated by conflicting national and global interests: population growth has sometimes been regarded as a means of sovereignty and economic advance. Even today, there are exhortations to increase the birth rate (e.g. 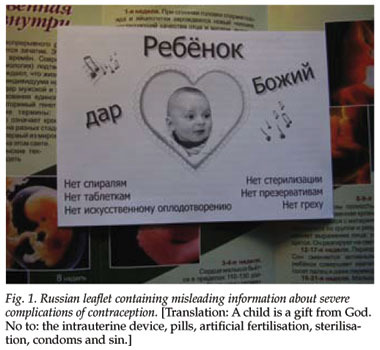 in Russia), accompanied by misinformation about severe complications of contraception and abortions (Fig. 1). However, with increasing globalisation, the community of interests of all mankind becomes more evident. Global birth control by means of widespread sterilisation requires investment and considerable managerial efforts; all simpler and less expensive solutions would be less humane. As a source of financing, oil and gas revenues, which are sometimes spent in a wasteful and unproductive manner, could be used. Only by concentrating power and authority within a powerful international executive can globalised leadership break the vicious circus of international competition and conflicts and create priorities for addressing overpopulation. Such globalisation can be applied only if existing national borders remain barriers to international migrations. Dr Jargin graduated from I M Sechenov Moscow Medical Academy in 1983. He is an associate professor in the Department of Pathology of the Peoples Friendship University of Russia, Moscow. Additionally, his interests include environmental pathology and consequences of the Chernobyl disaster, health care organisation, social aspects of architecture and town planning, demography and overpopulation, and he has had articles on these topics published in Russia and abroad.